In cooperation with the ESL, Europe's leading e-sport league, Enermax has arranged a big raffle for the female gaming community. The manufacturer sponsors five product bundles with a total worth of 1,200 Euro. No doubt, that the limited Ostrog edition in Pink is the highlight of these high-end packages. 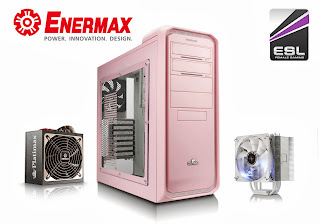 Enermax will sell only few pieces of this special Ostrog edition in Europe (less than 30 cases). Apart from that, the bundles contain one high-performance Enermax Platimax 500W power supply and an eye-catching Enermax ETS-T40 White Cluster cooler. The contest lasts until Monday, the 7th of October 2013, and is open for users from whole Europe. More information about the competition and the terms for participation: http://www.esl.eu/eu/female/news/229639/. In attachment you can find a press photo. We would be glad if you could inform your readers about the unique opportunity to win one of these gaming bundles.